Booking discovery calls can feel like an never ending uphill battle. But it doesn’t have to be that way! I’ll share 3 important things you can do to start booking more calls right away! For those of you who are coaches or are in the service-based industry and you rely on clients and referrals to get work through your door, then this live stream is for you. 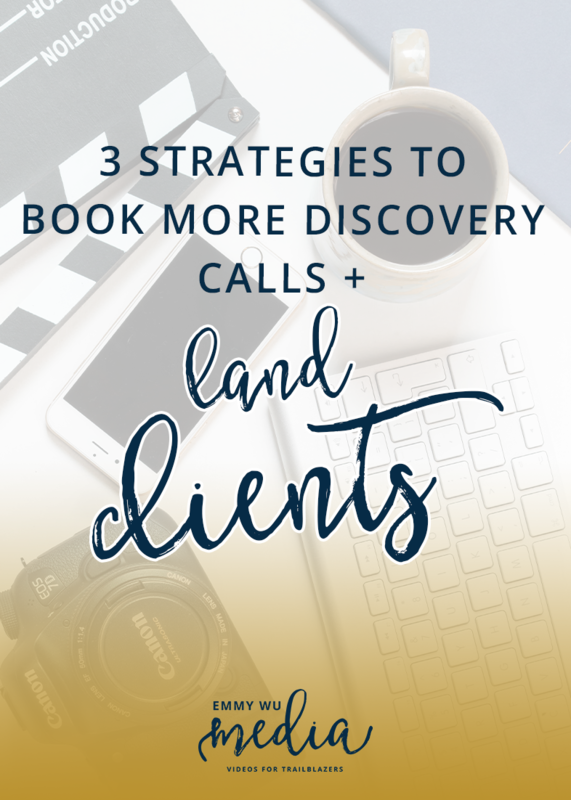 Let’s get you more discovery calls so you can land more clients! I’ve done my fair share of getting clients through the good ol’ fashioned technique of video calls. This is going to be so important because I’ve done a lot of these in the past and I’m pretty sure I can give you some good tips to help you with your discovery calls! DON’T FEAR IT: we’re trained to be good girls, don’t ask for too much, raise your hand before you can speak, so it’s no wonder that when it comes time for the ask, we’re terrified. But know fear is learned, and you can unlearn it. YOU’RE NOT BEING INTERVIEWED: Don’t approach this like you’re being interviewed, approach as if you’re having a genuine conversation with another person to see if you’re a good match! YOU GROW YOUR CONFIDENCE BY DOING IT: sure you might start out imperfect, feel nervous, but focus on being present, learning as much as you can about your prospect by asking lots of questions, and you will learn your own flow. DEMONSTRATE A CLEAR VALUE PROPOSITION FOR THE CALL, AND NOT SOME VAGUE “BOOK A STRATEGY SESSION”. 3 things that work really well. OFFER A FREE TRAINING (LIVE VIDEO/WEBINAR) WITH YOUR DISCOVERY CALL AS YOUR CTA. Your takeaways? Remember that you should practice discovery calls to get good at them. Everything takes practice! Offer your readers an incentive to book one; make it clear, not vague. Put your discovery call as a call to action at the end of products or freebies! If you have any questions about booking more discovery calls and landing clients? Leave a comment below!